The program automatically detects which combination of filter is used in the image sequence. For each group the color indices are calculated. The color indices are tabulated and plotted in the Excel report. AAVSO and CBA reports will be generated in separate files for the untransformed and transformed data. The program will reduce groups of images for a maximum of five filters from the list (U, B, V, R, I, SU, SG, SR, SI, SZ) and will calculate the Transformation coefficients. You are not constrained to use all filters for calibration. You have to define a maximum of five filters in the "Transform parameters" tab, see next section. The program automatically detects which combination of filters is used in the image sequence and calculates the corresponding transformation coefficients. The calibration process needs the same number of images in each filters. The definition of the coefficients is provided here for the case when you use B V R I filters. If you use other filters the coefficients are defined in the same way by interchanging the letters defining the filters. The program generates the normal excel report and a TGReport text file. To analyse the consistency of the transformation coefficients, you may use the generated TGReport as input for the TransformationGenerator provided by AAVSO. It is also possible to enter manually your transformation coefficients in the right panel of "Transform parameters" tab. To get M67 standard field data, you may use the LesvePhotometry tab "AAVSO VSP tool" and introduce HW Cnc as variable star and check the box "StdField". - Var Min SNR : the reports will not include data if the SNR of target/variable, Reference and Check stars is lower than this value. See Which data are considered as valid? in the FAQ page. Before launching LesvePhotometry to calculate the Transformation coefficients on a set of images, you have to define a maximum of 5 Color Bands in the list U, B, V, R, I, SU, SG, SR, SI, SZ and click on "Validate Color Bands" button. The labels of Filter Band Coefficients and Color Index Coefficients in right panel will be updated accordingly. It is recommended to enter filters in this order from top to bottom. Othewise you will have unconventional coefficients like (V-B) instead of (B-V). Once the Color Bands are defined, you may run LesvePhotometry in Mode 3 (see section above) or enter manually your coefficients calculated with another program. LesvePhotometry is looking for needed parameters in the FITS header of image files. If parameters are not found, it will use the default parameters only if the corresponding check box has been checked. It is better to adapt parameters in the program used to control the camera. All parameters are stored in ASCOM Profile i.e. they will be re-used when you reopen the program, except some special parameters identified with a blue label. This tool able you to download and import comparison star sequences as provided by AAVSO. - Enter a Variable star name reconized by AAVSO VSP tool in the corresponding box. - Fill the Field of View and Maximal magnitude of comparison star boxes. - If you import a Standard field (e.g. M67), select the "StdField" box. TIP : To get M67 standard field data, you may use HW Cnc as variable star. - Click on "Download VSP sequence" button, the comparison star magnitude will appear in the left panel and a window with the corresponding chart will open. - In the left column of the left panel, select appropriate "Usage" value for up to 10 comparison stars. - Click on "Import VSP sequence in database" button and carefully read and answer the Message boxes. The sequence will be imported in your database. On webpage https://www.aavso.org/apps/vsd/stdfields you find a list of Standard open cluster fields and Landolt fields. A chart will open, click on "Photometry Table for This Chart"
Record the ChartID of the Photometry table, not the one on the chart. Indeed the ChartID given in the chart itself is incorrect for some Standard fields, due to a bug in AAVSO tool. 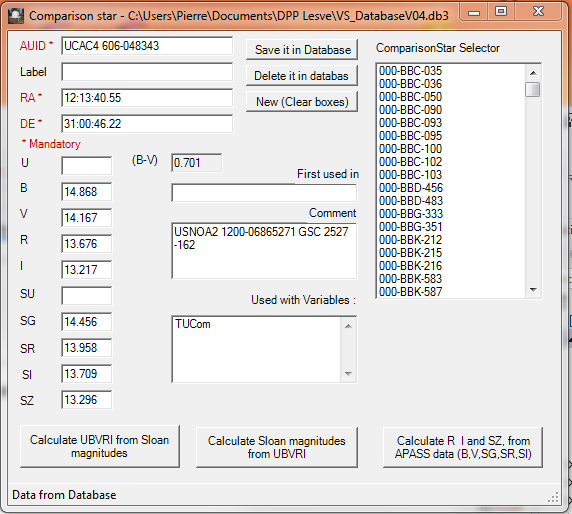 In LesvePhotometry, open the "AAVSO VSP tool" input ChartID and a name in "LesvePhotometry database VariableTableIndex". Click "Download VSP sequence" as usual. This field can be left blank if in the image file name the characters before a delimiter are the variable database key. The delimiter character ("-", "#" or "%") is user selectable in the "General Settings" tab. E.g. if image file name is IYUMa#R-001.fit, the program will search the database for a star having the key IYUMa. With this rule for image file names, you may run LesvePhotometry with a mix of different stars. If you mix different stars, specific reports will be created for each star. If you do not follow this rule for image file name, you have to input the database star key. Click this button to launch the program, a window will pop-up. Select your sky images for photometry. "Load 1 image for UCAC4 info"
You will be prompted to provide a directory and a name to your new database. - In Variable Selector window, click on a Variable name and all the fields for this Variable will be displayed. If you modify an entry click " Save it in database" button. - to import such a transfer file, in "File" drop down menu, select "Import..."
VariableTableIndex mandatory, is the table index key, it must be unique in the database. AAVSOVarName mandatory, is used in the report file names and as the star name in the AAVSO report. As it is used as a part of report file name it can't use the following characters. If you use one of those character it will be replaced by a blank in the report file names. CK this star will be used as the check star, ONLY ONE star as check star. C this star will be used as another check star but not included in the AAVSO report. "Usage" field will be left blank, if you don't want to use the corresponding comparison star but nevertheless you want to keep it. Now you can introduce the comparison star data. To insert a new comparison star, type its name in the CMP field of the Variable and double-click the name. Classical Johnson U B V and Cousins R I and Sloan filters u' g' r' i' z' are supported by LesvePhotometry. The references to Sloan filters are those used by AAVSO : SU SG SR SI SZ for u' g' r' i' z', respectively. Those references must be used in the image FITS header for the FILTER keyword. Two buttons are provided to calculate the magnitude from one system to another system. The following relationships (Jester et al. 2005 AJ 130, 873 http://arxiv.org/abs/astro-ph/0506022v1) are used to convert reference magnitudes in UBVRI system to Sloan system. The AAVSO Photometric All-Sky Survey APASS is conducted in five filters : Johnson B and V plus Sloan SG SR SI. The AAVSO "Seqplot" tool also uses the first two relationships for calculating R and I magnitudes. The DSLR filters TB, TG, TR are also supported in accordance to AAVSO specifications. In "Maintenance of a Database" you have an option to export star Groups (i.e. data of a Variable star and its comparison stars) in a transfer file. - In "File" drop down menu, select "Import Variable and comparison stars.". - You will be first prompted to select a database and after to select a transfer file with extension ".txt". If the Variable star is already in the database, you will be asked if you want to override the data (Yes) or to skip these data (No) or to abort the importation (Cancel). A example of the content of an exported group is given hereafter. Each line starts with the token "Variable" or "Comparison" and continues with all the star data. The release of PinPoint 6.0 (dc3.com) includes support of the Fourth U.S. Naval Observatory CCD Astrograph Catalog (UCAC4). LesvePhotometry has been tested successfully with PinPoint 6.0 version. However, LesvePhotometry V 1.2.0.40 already gives access the UCAC4 catalog information with previous PinPoint versions. This catalog is interesting for users as it contains the AAVSO Photometric All-Sky Survey magnitudes (APASS release DR6 -June 2012) http://www.aavso.org/apass. 2012 Aug:UCAC4 was released in August 2012. It is available from CDS as Vizier catalog I/322; DVDs have been shipped to all customers on file. To receive a free copy of the UCAC4 catalog on DVD please send a request to brenda.hicks[at]navy.mil with "UCAC4" in subject and your full name and postal mailing address in the body of your e-mail. - In any case, you have to apply UCAC4 corrections for a small number of high proper motion stars. To do the corrections, download the program "modifs.exe" from http://www.usno.navy.mil/USNO/astrometry/optical-IR-prod/ucac copy it in your UCAC4 folder and run it. It takes a few ten seconds to correct the UCAC4 catalog. - Launch LesvePhotometry and in "PinPoint parameters" tab, enter the path the UCAC4 catalog folder but do not select this catalog for use at this time. - Select any catalog (e.g.GSC ACT) currently supported by your PinPoint release. Don't choose UCAC4 if you don't have the PinPoint 6.0 yet. - In this sky image window, click on a star and a window displaying "UCAC4 Catalog Information" will pop-up. - The first lines refer to the data found by PinPoint, i.e. information from the catalog chosen in "PinPoint parameters" tab. PinPoint does not match all detected stars to the catalog. In this case the information fields are left blank. - The other lines are UCAC4 star data, i.e. data of the closest star to the matched one by PinPoint. If the star is not matched by PinPoint, the program chooses the star in respect to the position of mouse click. The position tolerance is 5 arc seconds. - For your convenience you may also mark the selected star with the button "Mark the star". - In UCAC4 "Catalog Information" window click on "Copy UCAC4 info to clipboard" button. -	In "Variable star" window, click on "Get UCAC4 info from clipboard", you will be prompted for a comparison star number (n = 1 to 10) corresponding to the CMPn textbox. The data will be automatically copied in the comparison star window. -	Repeat this process for other comparison stars and before saving your work don't forget to save data in the database. - Photometry excel report with a chart presenting the light curve. - Csv report (Comma separated values). Exactly the same as Photometry excel report, but useful if you don't have Microsoft Excel. - Lew's Plotter excel report. Lew Cook has developed a plotting excel workbook to plot data given in the format of AAVSO extended report. For your convenience, LesvePhotometry is able to create a copy of the Lew's master excel workbook and directly paste the data inside the excel workbook. This excel workbook has 14 different plots, e.g. airmass, instrumental magnitude against time but also magnitude errors against airmass or magnitude. All the Lew's Plotter capabilities and explanations are given at http://www.lewcook.com/lewaavsoformatplot.htm Many thanks to Lew Cook who wrote this excel workbook and authorized its distribution. The report files are saved in the same directory as the analyzed ccd images. Beside the 3 reports, two windows are open for measurement of light curve extrema. The algorithm used for the smoothing is known as Reinsch spline. A theoretical document of the algorithm is provided with the program installation. The Reinsch Spline program (ReinschSpline.exe) can be also used standalone. The Spline function is used to calculate an extremum (maximum or minimum) of the light curve. 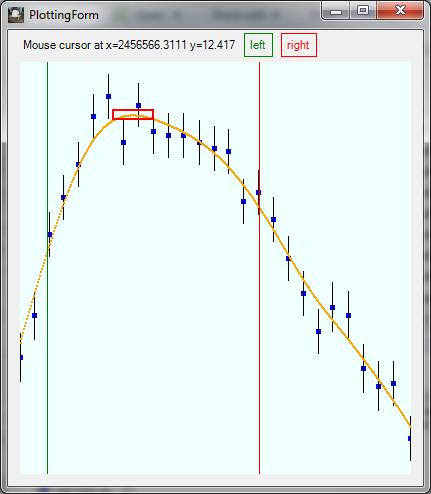 After getting the light curve with ReadClipboard" button, the data points and the spline curve are displayed in the Plotting Form. At this time you have to click on "left" and "right" buttons to set the left and right limits used by the algorithm to determine the extremum. The left and right limits must encompass only one extremum. As soon as these limits are set, the extremum parameters are calculated: i.e. ToM and Mag@M. You can save these results with "Save to Clipboard" and "Save to file" buttons, four numbers are saved, e.g. which are Extremum magnitude value and uncertainty, HJD or JD of Extremum value and uncertainty. The uncertainties calculations are based on data encompassed by the left and rights limits. If you enter star coordinates and check the box "Apply Heliocentric corrections" the extremum will be expressed in HJD instead of JD. With the "Keep only center data" button, the Plotting Form will show only data included between the left and right limits. This feature is useful if you want to only examine a part of the light curve. If the Reinsch Spline function is called by the LesvePhotometry program, the star coordinates are also provided and the "Apply Heliocentric corrections" option is checked by default.